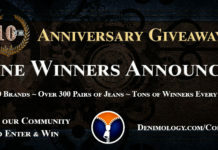 J Brand Denim Co is offering Denimology readers a chance to win $500 worth of J Brand Denim Co jeans. The men’s line reflects modern basics with a vintage sensibility inspired by classic Americana. Choose from classic styles such as the Kane with a slim straight leg, the Walker with a relaxed straight leg, or the new Dylan, styled with a slouchy, tapered fit. Please note that by entering this competition you are agreeing to receive email newsletters from both Denimology and J Brand. Only one entry per email address will be accepted and the closing date for entries is August 15th, 2009. I trie to enter the sweepstake but the page with my information wont move on! I’d love to win and it closes on my birthday…hopefully I iwll win and it will be my gift this year. J Brand jeans are fan-reekin-tastic!!! An a 500$ jean giveaway would be able to help me out a lot. I’ve lost 75 pounds and have no clothes that fit me anymore. I have my thin frame back and want to start wearing form fitted clothing now. This would help out a ton!!!!!! Drop by my Polyvore group and enter the contest to win any 1 pair of Frankie B jeans of your choice. Read ALL of the directions. If you’re not familiar with Polyvore just message me after you join and I’ll help you. I’m also having a contest in Everything Handbags and a Cinda B hipster is up for grabs there. Then in 2 weeks when it’s over I’ll be having a contest for The Sak.com and a handbag will go to 3 winners there to. hope this one enters for me! That is my email address and they have not sent me any prize at all. I have emailed Denimology but they are ignoring me. We are not ignoring you, you mailed me over the weekend when I was visiting my sick mother. When I got your mail on Monday morning I immediately sent you my phone number so we could sort this out.